Triangles come either in 30-60-90 degree angles or 45-90 degree angles. Also available are triangles with an inking edge for ruling pens. We feature Lance triangles as well as steel triangles for professional use and Art Alternative triangles for student use. Alvin 4 inch Academic Transparent Triangle 45?/90? Alvin 4 inch Academic Transparent Triangle 30?/60? Alvin 14 inch Cutting Edge Triangle 45?/90? Alvin 10 inch Cutting Edge Triangle 45?/90? Alvin 14 inch Cutting Edge Triangle 30?/60? Alvin 10 inch Cutting Edge Triangle 30?/60? Alvin 8 inch Fluorescent Professional Acrylic Triangle 45?/90? Alvin 6 inch Fluorescent Professional Acrylic Triangle 45?/90? Alvin 4 inch Fluorescent Professional Acrylic Triangle 45?/90? Alvin 14 inch Fluorescent Professional Acrylic Triangle 45?/90? Alvin 12 inch Fluorescent Professional Acrylic Triangle 45?/90? Alvin 10 inch Fluorescent Professional Acrylic Triangle 45?/90? Alvin 4 inch Clear Professional Acrylic Triangle 45?/90? 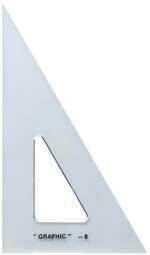 Alvin 24 inch Clear Professional Acrylic Triangle 45?/90? Alvin 18 inch Clear Professional Acrylic Triangle 45?/90? Alvin 16 inch Clear Professional Acrylic Triangle 45?/90? Alvin 8 inch Fluorescent Professional Acrylic Triangle 30?/60? Alvin 6 inch Fluorescent Professional Acrylic Triangle 30?/60? Alvin 4 inch Fluorescent Professional Acrylic Triangle 30?/60? Alvin 14 inch Fluorescent Professional Acrylic Triangle 30?/60? Alvin 12 inch Fluorescent Professional Acrylic Triangle 30?/60? Alvin 10 inch Fluorescent Professional Acrylic Triangle 30?/60? Alvin 4 inch Clear Professional Acrylic Triangle 30?/60? Alvin 24 inch Clear Professional Acrylic Triangle 30?/60? Alvin 18 inch Clear Professional Acrylic Triangle 30?/60? Alvin 16 inch Clear Professional Acrylic Triangle 30?/60?